That was Alexander Grischuk’s view after the third game of the Candidates Final ended in a 14-move draw. 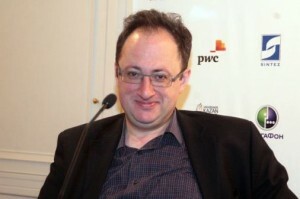 In a press conference that mirrored the game – it was short but packed with memorable incident – Gelfand also explained how his first encounter with grandmasters ended in failure. Below I’ve translated the quotes from the press conference that were included in Vladimir Barsky’s round-three report for the Russian Chess Federation website. Even if you don’t know Russian it’s worth having a look at for the photos. There’s a saying: God created men different, but Colt made them equal. I think you can say more or less the same about the Queen’s Gambit. This was my ninth Queen’s Gambit here in Kazan. Well, what can I say? 9…b5 is a very interesting novelty. It was a little unexpected, as after all the pawn’s under attack twice. In principle, however, it’s no wonder there’s such a possibility – after all, White first gave up the bishop for a knight, and then started jumping around with the queen: 7. Qb3, 8. Qxc4. And then Black has something dynamic and tactical like that. It wasn’t a great surprise for me. I think after that move White has quite a lot of ways of losing by force, as some lines are extremely dangerous. For example, 10. Qd3 (apparently a safe move), but then 10…Bb7 11. Bg2 Nc6, and it’s no longer clear how you can save the pawn. 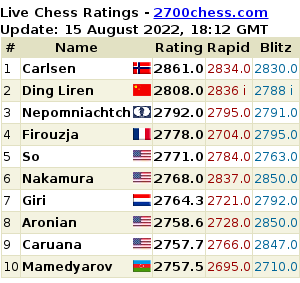 It’s clear that analysis will be able to find various normal ways of playing as White, in particular the way I played. I think Borya made an accurate move 13…a5, as otherwise Black might still have problems. And in the final position Black has a very strong initiative for the pawn, more than enough for a draw. On the other hand, White also shouldn’t lose, of course. Black got full compensation for the pawn. It seems to me White played correctly, posing certain problems, but 13…a5, in my view, is an accurate move that completely equalises. And in the final position neither side can try to play for a win: the pressure on the open files and the dark-squared bishop compensate for the pawn, but Black can’t achieve anything more, and White also has to play accurately. 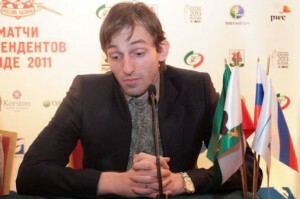 At this point Vladimir Barsky reminded Grischuk of his promise (in the press conference after the semifinals) to answer a question on how spending time with great chess players had influenced him. The question’s based on this interview with Vassily Ivanchuk, who had his illusions about great chess players shattered. Yes, I thought about it a little. Overall, when children or adolescents are growing up, they’re under the illusion that famous people are all great, that they only think about higher matters. While in fact, of course, when you get to know people it turns out that everyone’s thoughts are approximately the same – banal. I wouldn’t describe that as a disappointment, but a natural process. It’s possible to agree with Ivanchuk that it gets rid of illusions. In general, a person initially has a lot of illusions, but unfortunately life dispels the majority of them. No, I didn’t know her, and I didn’t manage to establish a bond with the grandmasters. Frustration all round! lol!! 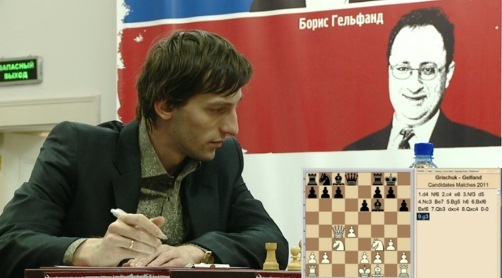 pity these two (esp gelfand) were out of the media till now…. ah, sorry about the wrong spelling (i’ve stopped apologizing for my laziness now… a longer sentence saying ‘the word is missing’ would’ve saved u time). “man” now conveys the meaning, thx. btw, the kamsky interview was one u cud’ve skipped (only the part about being different from grischuk was worth it)…. the first time i felt that way about one of your articles. I did not feel the same way about the Kamsky interview!! I enjoyed it! Sure the interviewer as a non chess media person had terrible questions. But Kamsky gave those questions great value. Russian media truly treats chess players as celebrities. When you are a celebrity you are bound to get questions that try to sneak peak into your life more than the technicalities behind their art.